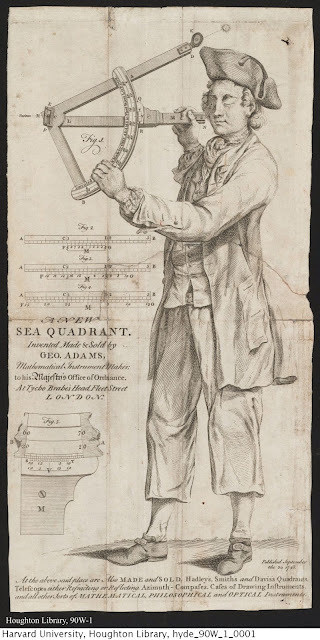 A New Sea Quadrant, George Adams, 1748, Houghton Library, Harvard University via Capitu Tumblr. 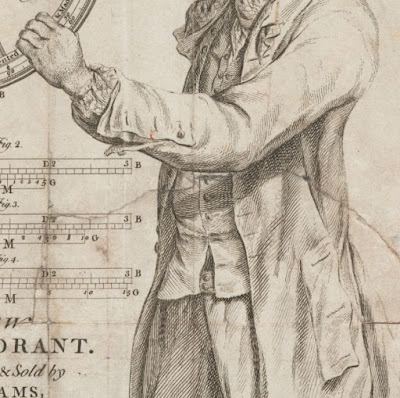 George Adams entered the navigational instrument business at an early age, apprenticing under James Parker before opening his own shop in 1738. 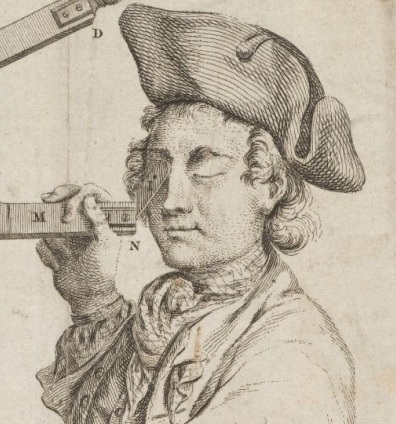 Ten years later he had developed a new instrument for taking latitudinal readings. 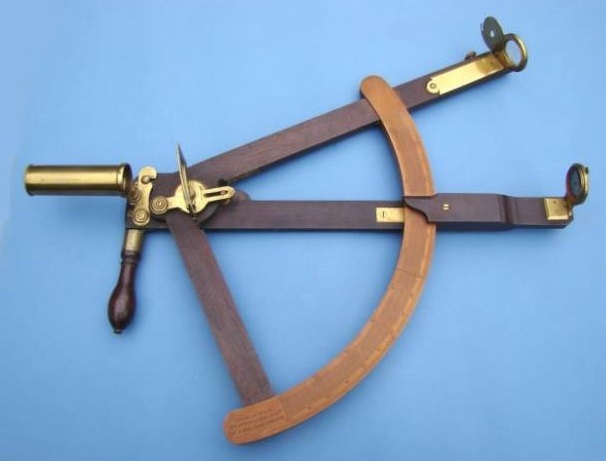 Intended to be more versatile than the backstaff and less expensive than the octant, Adams' quadrant did not eclipse the recently invented octant, nor did it survive the growth of the soon to be invented sextant. There is only one surviving example of his invention, which now resides in the collection of the Mariners' Museum and Park in Newport News, Virginia. In advertising his creation, Adams depicts a common sailor lifting the device to his eye and sighting the horizon. The choice of a common sailor may have been to emphasize ease of use. He wears a simple cocked hat with a button loop on the left side and no binding. Under his short hair is a plaid neckcloth stuffed into the uppermost buttonhole of his jacket. The cuffs of his single breasted jacket are open, with only one of the three buttons in place. At his waist is a flap pocket turned vertically. This is the first time I've seen such an arrangement on a sailor's jacket. His waistcoat is plain and single breasted. Ending just above the bottom of his calf, our sailor's trousers are held at the waist with a simple two button closure. He wears white stockings and pointed toe shoes with roughly rectangular buckles. Interesting: and, of course, another project to fit into the queue! Nice, detailed illustration of basic watdrobe, too! Nice illustration of clothing derails. Note the hat almost worn completely with the point to the rear (backwards) a common sailor fashion of the period, as you've shown in sundry other prints. Wow, amazing content on your blog. 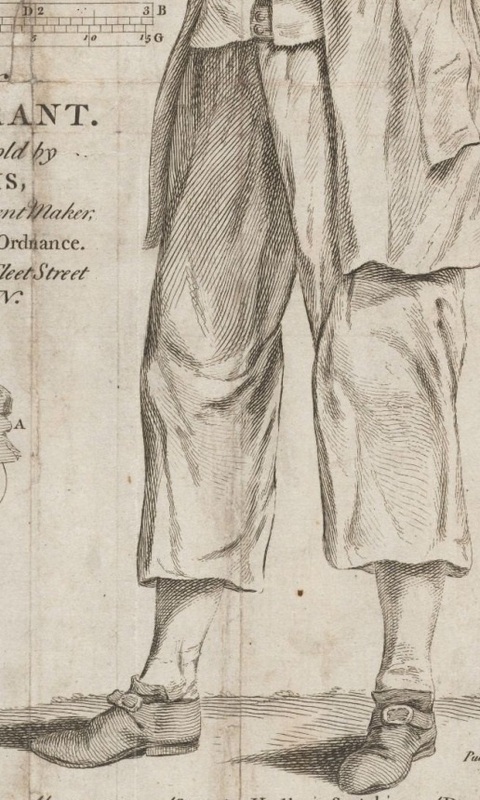 I'm researching british sailor clothing for a biographical graphic novel about John Newton, and this is the exact period of clothing I'm looking for. Now, about the pocket on the jacket, would those normally be horizontal, but have the same type of flap? Pockets were usually horizontal. I haven't gone through and sorted out pocket styles, so take my following advice with a grain of salt. Anecdotally speaking, I think slit pockets are more commonly portrayed. I should also add that what is represented on this blog is largely what artists thought sailors should look like, rather than a true-to-life mirror of sailors clothing. I believe you can get a solid idea of an average sailor's appearance from these posts, but always bear in mind that virtually none of these images can be taken at face value on their own.